pseudoparanormal: Carl Sagan's "The Demon Haunted World"
Carl Sagan's The Demon Haunted World: Science As a Candle in the Dark provides interesting, entertaining, and insightful criticism on common pseudoscientific beliefs. The book deals with UFO abductions, auras, Big Foot, witchcraft, psychokinesis, and a slew of other paranormal topics that are popular in this, our "demon haunted world." Throughout the book, Sagan not only points out the lack of evidence available to prove the existance of paranormal phenomenon, but shares his thoughts on why such beliefs exist in the first place. As an advocate for valid scientific practices, Sagan civilly draws the line between science and pseudoscience, and offers both thoughtful reasoning and a humble critique. Sagan points out that the media, advertizers, and even scientists themselves view the general public as too ignorant to understand science, and emphasizes the fact that understanding true science is essential to our continued survival as a society. He suggests that many pseudoscientific beliefs are the product of our desire to believe in a reality in which we'd like to live, and not the one in which we are actually a part of. Some major topics that the book covers are aliens and alien abductions, religion, crop circles, magic, and Sagan's "Baloney Detection Kit," which imparts on us some valueable tools for sceptical thinking, such as the understanding that there are no true "authorities" when it comes to science. The Baloney Detection Kit, in all honesty, is probably my favorite part of the book. Introduced halfway through the book, the Baloney Detection Kit provides some clear and intelligent rules to scientific reasoning and skepticism. Chief among these rules, in my opinion, is that in a chain of argument, each and every link in the chain needs to work. I feel as though most pseudoscientific ideas fall to this rule. This even applies to topics we've covered in our lectures, such as clairvoyance, past-lives, and ESP. Each argument presented by such phenomenon holds a suspension of disbelief that breaks the chain of argument. The Baloney Detection Kit also calls for independent confirmation of facts, and suggests that we not get too attached to a single hypothesis. It calls for the separation of variables, and explains the virtues of double-blind studies. 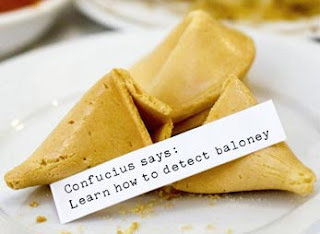 I think that the Baloney Detection Kit accurately summarizes Sagan's policy for dealing with pseudoscience. The Demon Haunted World really ties into our course well, in that it challenges all pseudoscienific ideas with a heavy dose of logic and reasoning. Chapter 12 of the book (the Baloney Detection chapter, incidentally) reminded me of the beginning of our course and the Q-Ray Ionized Bracelet. In the book, Sagan points out that advertizers can be extremely deceptive about their products, often in ways that should insult the intelligence of many consumers, while playing on the gullibily of others. The Q-Ray Bracelet is a great example of this, as it proved that a large number of people will believe a pseudoscientific idea, regardless of the lack of scientific evidence supporting it. In fact, Chapter 4 points out that the belief that magnetism could cure disease has been around for centuries, with no concrete evidence to back it up. The fact that this idea is still as widespread as it is today is a bold example of the lapse in logic that people tend to fall victim to. This book really suppliments our course material well, providing further insight on why people believe in psuedoscienctific ideas and how it effects the world we live in. In many ways, the concepts discussed in The Demon Haunted World are not only evident in our daily lives, but may help us make more logical decisions when it comes to what we believe about the world around us. Despite all of our scientific advances, we still live in a very superstitious time, where baseless fears regarding the end of the world and things that go bump in the night run rampant. Carl Sagan shows that if we take a logical look at the facts, and only the facts, we can break the ties that pseudosciences has on us as society.